The SA-9 (Saturn I Block II), the eighth Saturn I flight, lifted off on February 16, 1965. This was the first Saturn with an operational payload, the Pegasus I meteoroid detection satellite. 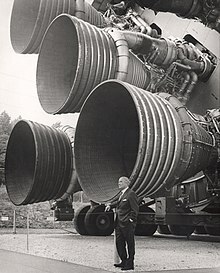 The Saturn family of American rocket boosters was developed by a team of mostly German rocket scientists led by Wernher von Braun to launch heavy payloads to Earth orbit and beyond. Originally proposed as a military satellite launcher, they were adopted as the launch vehicles for the Apollo moon program. Three versions were built and flown: Saturn I, Saturn IB, and Saturn V.
The Saturn name was proposed by von Braun in October 1958 as a logical successor to the Jupiter series as well as the Roman god's powerful position. In 1963, president John F. Kennedy identified the Saturn I SA-5 launch as being the point where US lift capability would surpass the Soviets, after having been behind since Sputnik. He last mentioned this in a speech given at Brooks AFB in San Antonio on the day before he was assassinated. To date, the Saturn V is the only launch vehicle to transport human beings beyond low Earth orbit. A total of 24 humans were flown to the Moon in the four years spanning December 1968 through December 1972. No Saturn rocket failed catastrophically in flight. In the early 1950s, the US Navy and US Army actively developed long-range missiles with the help of German rocket engineers who were involved in developing the successful V-2 during the second World War. These missiles included the Navy's Viking, and the Army's Corporal, Jupiter and Redstone. Meanwhile, the US Air Force developed its Atlas and Titan missiles, relying more on American engineers. Infighting among the various branches was constant, with the United States Department of Defense (DoD) deciding which projects to fund for development. On November 26, 1956, Defense Secretary Charles E. Wilson issued a memorandum stripping the Army of offensive missiles with a range of 200 miles (320 km) or greater, and turning their Jupiter missiles over to the Air Force. From that point on, the Air Force would be the primary missile developer, especially for dual-use missiles that could also be used as space launch vehicles. In late 1956, the Department of Defense released a requirement for a heavy-lift vehicle to orbit a new class of communications and "other" satellites (the spy satellite program was top secret). The requirements, drawn up by the then-unofficial Advanced Research Projects Agency (ARPA), called for a vehicle capable of putting 9,000 to 18,000 kilograms into orbit, or accelerating 2,700 to 5,400 kg to escape velocity. Since the Wilson memorandum covered only weapons, not space vehicles, the Army Ballistic Missile Agency (ABMA) saw this as a way to continue development of their own large-rocket projects. In April 1957, von Braun directed Heinz-Hermann Koelle, chief of the Future Projects design branch, to study dedicated launch vehicle designs that could be built as quickly as possible. Koelle evaluated a variety of designs for missile-derived launchers that could place a maximum of about 1,400 kg in orbit, but might be expanded to as much as 4,500 kg with new high-energy upper stages. In any event, these upper stages would not be available until 1961 or 62 at the earliest, and the launchers would still not meet the DoD requirements for heavy loads. In order to fill the projected need for loads of 10,000 kg or greater, the ABMA team calculated that a booster (first stage) with a thrust of about 1,500,000 lbf (6,700 kN) thrust would be needed, far greater than any existing or planned missile. For this role they proposed using a number of existing missiles clustered together to produce a single larger booster; using existing designs they looked at combining tankage from one Jupiter as a central core, with eight Redstone diameter tanks attached to it. This relatively cheap configuration allowed existing fabrication and design facilities to be used to produce this "quick and dirty" design. Two approaches to building the Super-Jupiter were considered; the first used multiple engines to reach the 1,500,000 lbf (6,700 kN) mark, the second used a single much larger engine. Both approaches had their own advantages and disadvantages. Building a smaller engine for clustered use would be a relatively low-risk path from existing systems, but required duplication of systems and made the possibility of one engine failure much higher (adding engines generally reduces reliability, as per Lusser's law). A single larger engine would be more reliable, and would offer higher performance because it eliminated duplication of "dead weight" like fuel plumbing and hydraulics for steering the engines. On the downside, an engine of this size had never been built before and development would be expensive and risky. The Air Force had recently expressed an interest in such an engine, which would develop into the famed F-1, but at the time they were aiming for 1,000,000 lbf (4,400 kN) and the engines would not be ready until the mid-1960s. The engine-cluster appeared to be the only way to meet the requirements on time and budget. Super-Jupiter was the first-stage booster only; to place payloads in orbit, additional upper stages would be needed. ABMA proposed using either the Titan or Atlas as a second stage, optionally with the new Centaur upper-stage. The Centaur had been proposed by General Dynamics (Astronautics Corp.) as an upper stage for the Atlas (also their design) in order to quickly produce a launcher capable of placing loads up to 8,500 lb (3,900 kg) into low Earth orbit. The Centaur was based on the same "balloon tank" concept as the Atlas, and built on the same jigs at the same 120-inch (3,000 mm) diameter. As the Titan was deliberately built at the same size as well, this meant the Centaur could be used with either missile. Given that the Atlas was the higher priority of the two ICBM projects and its production was fully accounted for, ABMA focussed on "backup" design, Titan, although they proposed extending it in length in order to carry additional fuel. In December 1957, ABMA delivered Proposal: A National Integrated Missile and Space Vehicle Development Program to the DoD, detailing their clustered approach. They proposed a booster consisting of a Jupiter missile airframe surrounded by eight Redstones acting as tankage, a thrust plate at the bottom, and four Rocketdyne E-1 engines of 360 to 380,000 lbf (1,700 kN). The ABMA team also left the design open to future expansion with a single 1,500,000 lbf (6,700 kN) engine, which would require relatively minor changes to the design. The upper stage was the lengthened Titan, with the Centaur on top. The result was a very tall and skinny rocket, quite different from the Saturn that eventually emerged. Specific uses were forecast for each of the military services, including navigation satellites for the Navy; reconnaissance, communications, and meteorological satellites for the Army and Air Force; support for Air Force manned missions; and surface-to-surface logistics supply for the Army at distances up to 6400 km. Development and testing of the lower stage stack was projected to be completed by 1963, about the same time that the Centaur should become available for testing in combination. The total development cost of $850 million during the years 1958–1963 covered 30 research and development flights, some carrying manned and unmanned space payloads. While the Super-Juno program was being drawn up, preparations were underway for the first satellite launch as the US contribution to the International Geophysical Year in 1957. For complex political reasons, the program had been given to the US Navy under Project Vanguard. The Vanguard launcher consisted of a Viking lower stage combined with new uppers adapted from sounding rockets. ABMA provided valuable support on Viking and Vanguard, both with their first-hand knowledge of the V-2, as well as developing its guidance system. The first three Vanguard suborbital test flights had gone off without a hitch, starting in December 1956, and a launch was planned for late 1957. But in the midst of the cold war, Vanguard's cool scientific goal proved to be disastrously modest: the Russians got there first. The post-Sputnik White House explanation that the U.S. was not in a satellite "race" with Russia was not just an after-the-fact alibi. Said Dr. Hagen ten months ago: "We are not attempting in any way to race with the Russians." But in the eyes of the world, the U.S. was in a satellite race whether it wanted to be or not, and because of the Administration's costly failure of imagination, Project Vanguard shuffled along when it should have been running. It was still shuffling when Sputnik's beeps told the world that Russia's satellite program, not the U.S.'s, was the vanguard. von Braun responded to Sputnik I's launch by claiming he could have a satellite in orbit within 90 days of being given a go-ahead. His plan was to combine the existing Jupiter C rocket (confusingly, a Redstone adaptation, not a Jupiter) with the solid-fuel engines from the Vanguard, producing the Juno I. There was no immediate response while everyone waited for Vanguard to launch, but the continued delays in Vanguard and the November launch of Sputnik II resulted in the go-ahead being given that month. von Braun kept his promise with the successful launch of Explorer I on January 31, 1958. Vanguard was finally successful on March 17, 1958. Concerned that the Soviets continued to surprise the U.S. with technologies that seemed beyond their capabilities, the DoD studied the problem and concluded that it was primarily bureaucratic. As all of the branches of the military had their own research and development programs, there was considerable duplication and inter-service fighting for resources. Making matters worse, the DoD imposed its own Byzantine procurement and contracting rules, adding considerable overhead. To address these concerns, the DoD initiated the formation of a new research and development group focused on launch vehicles and given wide discretionary powers that cut across traditional Army/Navy/Air Force lines. The group was given the job of catching up to the Soviets in space technology as quickly as possible, using whatever technology it could, regardless of the origin. Formalized as Advanced Research Projects Agency (ARPA) on February 7, 1958, the group examined the DoD launcher requirements and compared the various approaches that were currently available. At the same time that ABMA was drawing up the Super-Juno proposal, the Air Force was in the midst of working on their Titan C concept. The Air Force had gained valuable experience working with liquid hydrogen on the Lockheed CL-400 Suntan spy plane project and felt confident in their ability to use this volatile fuel for rockets. They had already accepted Krafft Ehricke's arguments that hydrogen was the only practical fuel for upper stages, and started the Centaur project based on the strength of these arguments. Titan C was a hydrogen-burning intermediate stage that would normally sit between the Titan lower and Centaur upper, or could be used without the Centaur for low-Earth orbit missiles like Dyna-Soar. However, as hydrogen is much less dense than "traditional" fuels then in use, especially kerosene, the upper stage would have to be fairly large in order to hold enough fuel. As the Atlas and Titan were both built at 120" diameters it would make sense to build Titan C at this diameter as well, but this would result in an unwieldy tall and skinny rocket with dubious strength and stability. Instead, Titan C proposed building the new stage at a larger 160" diameter, meaning it would be an entirely new rocket. In comparison, the Super-Juno design was based on off-the-shelf components, with the exception of the E-1 engines. Although it too relied on the Centaur for high-altitude missions, the rocket was usable for low-Earth orbit without Centaur, which offered some flexibility in case Centaur ran into problems. ARPA agreed that the Juno proposal was more likely to meet the timeframes required, although they felt that there was no strong reason to use the E-1, and recommended a lower-risk approach here as well. ABMA responded with a new design, the Juno V (as a continuation of the Juno I and Juno II series of rockets, while Juno III and IV were unbuilt Atlas- and Titan-derived concepts), which replaced the four E-1 engines with eight H-1s, a much more modest upgrade of the existing S-3D already used on the Thor and Jupiter missiles, raising thrust from 150,000 to 188,000 lbf (670 to 840 kN). It was estimated that this approach would save as much as $60 million in development and cut as much as two years of R&D time. Initiate a development program to provide a large space vehicle booster of approximately 1 500 000-lb. thrust based on a cluster of available rocket engines. The immediate goal of this program is to demonstrate a full-scale captive dynamic firing by the end of CY 1959. This was followed on September 11, 1958 with another contract with Rocketdyne to start work on the H-1. On September 23, 1958, ARPA and the Army Ordnance Missile Command (AOMC) drew up an additional agreement enlarging the scope of the program, stating "In addition to the captive dynamic firing..., it is hereby agreed that this program should now be extended to provide for a propulsion flight test of this booster by approximately September 1960." Further, they wanted ABMA to produce three additional boosters, the last two of which would be "capable of placing limited payloads in orbit." By this point many in the ABMA group were already referring to the design as Saturn, as von Braun explained it as a reference to the planet after Jupiter. The name change became official in February 1959. In addition to ARPA, various groups within the US government had been considering the formation of a civilian agency to handle space exploration. After the Sputnik launch, these efforts gained urgency and were quickly moved forward. NASA was formed on July 29, 1958, and immediately set about studying the problem of manned space flight, and the launchers needed to work in this field. One goal, even in this early stage, was a manned lunar mission. At the time, the NASA panels felt that the direct ascent mission profile was the best approach; this placed a single very large spacecraft in orbit, which was capable of flying to the Moon, landing and returning to Earth. To launch such a large spacecraft, a new booster with much greater power would be needed; even the Saturn was not nearly large enough. NASA started examining a number of potential rocket designs under their Nova program. NASA was not alone in studying manned lunar missions. von Braun had always expressed an interest in this goal, and had been studying what would be required for a lunar mission for some time. ABMA's Project Horizon proposed using fifteen Saturn launches to carry up spacecraft components and fuel that would be assembled in orbit to build a single very large lunar craft. This Earth orbit rendezvous mission profile required the least amount of booster capacity per launch, and was thus able to be carried out using the existing rocket design. This would be the first step towards a small manned base on the moon, which would require several additional Saturn launches every month to supply it. The Air Force had also started their Lunex Project in 1958, also with a goal of building a manned lunar outpost. Like NASA, Lunex favored the direct ascent mode, and therefore required much larger boosters. As part of the project, they designed an entirely new rocket series known as the Space Launcher System, or SLS (not to be confused with current SLS plans), which combined a number of solid-fuel boosters with either the Titan missile or a new custom booster stage to address a wide variety of launch weights. The smallest SLS vehicle consisted of a Titan and two strap-on solids, giving it performance similar to Titan C, allowing it to act as a launcher for Dyna-Soar. The largest used much larger solid-rockets and a much enlarged booster for their direct ascent mission. Combinations in-between these extremes would be used for other satellite launching duties. C-3, C-4, and C-5 – all based on different variations of a new lower stage using F-1 engines, variations of proposed S-II second stages, and proposed S-IV third stages. Contracts for the development of a new hydrogen-burning engine were given to Rocketdyne in 1960 and for the development of the Saturn IV stage to Douglas the same year. The challenge that President John F. Kennedy put to NASA in May 1961 to put an astronaut on the Moon by the end of the decade put a sudden new urgency on the Saturn program. That year saw a flurry of activity as different means of reaching the Moon were evaluated. Both the Nova and Saturn rockets, which shared a similar design and could share some parts, were evaluated for the mission. However, it was judged that the Saturn would be easier to get into production, since many of the components were designed to be air-transportable. Nova would require new factories for all the major stages, and there were serious concerns that they could not be completed in time. Saturn required only one new factory, for the largest of the proposed lower stages, and was selected primarily for that reason. The Saturn C-5 (later given the name Saturn V), the most powerful of the Silverstein Committee's configurations, was selected as the most suitable design. At the time the mission mode had not been selected, so they chose the most powerful booster design in order to ensure that there would be ample power. Selection of the lunar orbit rendezvous method reduced the launch weight requirements below those of the Nova, into the C-5's range. At this point, however, all three stages existed only on paper, and it was realized that it was very likely that the actual lunar spacecraft would be developed and ready for testing long before the booster. NASA therefore decided to also continue development of the C-1 (later Saturn I) as a test vehicle, since its lower stage was based on existing technology (Redstone and Jupiter tankage) and its upper stage was already in development. This would provide valuable testing for the S-IV as well as a launch platform for capsules and other components in low earth orbit. Saturn I – ten rockets flown: five development flights, and five launches of boilerplate Apollo spacecraft and Pegasus micrometeroid satellites. Saturn IB – nine launches; a refined version of the Saturn I with a more powerful first stage (designated the S-IB) and using the Saturn V's S-IVB as a second stage. These carried the first Apollo flight crew, plus three Skylab and one Apollo-Soyuz crews, into Earth orbit. Saturn V – 13 launches; the Moon rocket that sent Apollo astronauts to the Moon, and carried the Skylab space station into orbit. ^ Helen T. Wells; Susan H. Whiteley & Carrie E. Karegeannes. Origin of NASA Names. NASA Science and Technical Information Office. p. 17. ^ Bilstein (1996), p. 25. ^ Neufeld (2007), p. 341. ^ Dawson & Bowles (2004), p. 24. ^ Dawson & Bowles (2004), pp. 22–24. ^ Greicius, Tony (January 30, 2008). "Explorer 1 Mission Overview". Explorer 1: America's first spacecraft. Washington: NASA. Archived from the original on May 11, 2012. Retrieved May 11, 2012. ^ Grayzeck, Dr. Ed (April 20, 2012). "Vanguard 1". National Space Science Data Center. Washington: NASA. Archived from the original on May 11, 2012. Retrieved May 11, 2012. ^ Bilstein (1996), p. 27. ^ Bilstein (1996), p. 28. ^ Bilstein (1996), p. 31. ^ Cadbury (2006), p. 188. ^ Bilstein (1996), p. 37. ^ ‘’Saturn Illustrated Chronology’’, Appendix H. Moonport, Appendix A. Apollo Program Summary Report, Appendix A.
Dawson, Virginia P.; Mark D. Bowles (2004). Taming Liquid Hydrogen: The Centaur Upper Stage Rocket 1958–2002 (PDF). The NASA History Series. Washington: NASA. ISBN 978-0-16-073085-6. This page was last edited on 6 March 2019, at 18:55 (UTC).